This months project is the Transom pattern. Constructed in 19mm MDF. All the component panels were cut on my local B&Q's board cutter which is easier than trying to get an 8'x4' sheet home with the added benefit that all the cuts are square and to size. 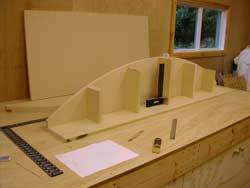 Then all I had to do was transfer the transom curve to one board and fire up the jigsaw then profile copy two more with my router. The first profile is bonded square to the base followed by the spacer panels. This is followed by the second profile and then the intermediate profile. 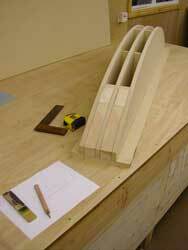 The outer sections are filled with solid timber to fasten the plywood laminates to during the laminating process.